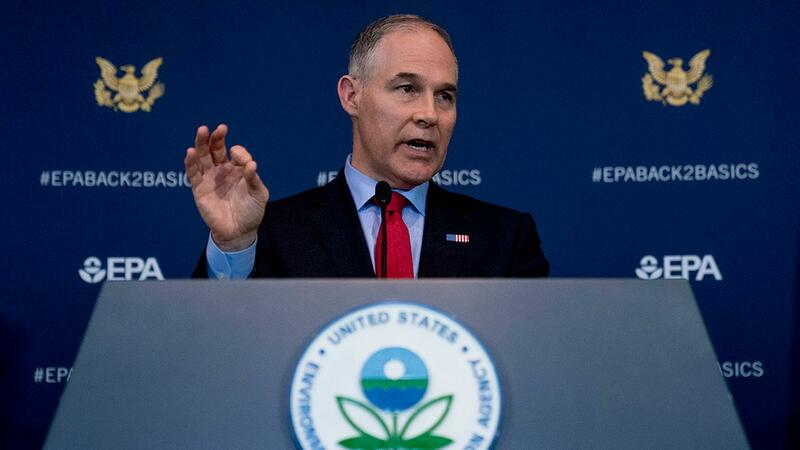 Radical environmentalists claimed a Trump cabinet member’s scalp yesterday as they forced out a great American patriot, EPA Administrator Scott Pruitt, under a cloud of largely invented ethics scandals. Nothing Pruitt did in office was unforgivable. Nothing he did was even particularly bad. Pruitt, previously attorney general of Oklahoma from January 2011 to February 2017, was the victim of a sustained, well-funded leftist assault aimed at crippling him and removing him from office. It succeeded. The Left, emboldened by its success, will now use this blueprint again and again against Trump administration officials. Pruitt’s expected successor, EPA’s second-in-command, former coal lobbyist Andrew Wheeler, will feel the Left’s wrath soon enough. President Trump had reportedly grown weary of the unending stream of bad publicity Pruitt brought with him. The official line is that Pruitt didn’t want to be a distraction. This may be true but it doesn’t excuse the lack of resources put into defending him. Boot Pruitt was apparently created by admitted communist and 9/11 truther Van Jones, a so-called social entrepreneur who is extremely adept at generating the illusion of grassroots activity in furtherance of his radical goals. The campaign was slick leftist astroturf manufactured by pressure groups beholden to George Soros and Tom Steyer. But Soros seems particularly heavily involved. A cursory examination of Boot Pruitt’s “Our Partners” pageshows several groups (or their sister organizations) that are funded by Soros through his philanthropies. Among those nonprofit organizations to receive funding from Soros’s Open Society Institute and/or the Foundation to Promote Open Society are: Center for American Progress Action Fund (Center for American Progress) ($10,541,376); UnidosUS Action Fund (National Council of La Raza) ($5,737,331); Natural Resources Defense Council ($3,962,907); Van Jones-founded Green for All ($350,000); Earthjustice ($305,000); Hip Hop Caucus Education Fund ($300,000); and Friends of the Earth ($50,000). Latino Victory Fund also appears on the list. Soros has donated $500,000 out of his own personal funds in the 2018 election cycle to Latino Victory PAC. One of Pruitt’s more psychotic media assassins, Jennifer Rubin, the phony conservative columnist the Washington Post hired to make all conservatives look affective and scatter-brained, was dancing on Pruitt’s political grave within hours of his resignation. Rubin herself has gleefully embraced the terrorism of the Left – she is one of the reasons Pruitt and other Trump officials have to spend extra money on security. After deranged restaurant co-owner Stephanie Wilkinson threw White House Press Secretary Sarah Huckabee Sanders and her family out of the Red Hen restaurant in Lexington, Va., and chased them around town because Sanders works for President Trump, Rubin cheered Wilkinson on. Sanders deserves a “life sentence” of public shaming, Rubin pontificated. In an environment in which Democrats, cheered on by the media, have been free to nearly assassinate House Majority Whip Steve Scalise (R-La. ), and violent attacks on other GOP office-holders and Trump supporters are becoming commonplace, Pruitt, whom the Secret Service said received the most threats of anyone in the cabinet, can’t be faulted for demanding extra security no matter how expensive. In the end, history will be kind to Pruitt. To describe his work at EPA as outstanding would be ridiculous understatement. Under Pruitt’s leadership, Obama-era Corporate Average Fuel Economy (CAFE) standards that would have forced passenger car and truck manufacturers to maintain a fleet-wide average of 54.5 miles per gallon by 2025 (up from 35.5 miles in 2016) were scrapped. This could save – no exaggeration – millions of Americans from death and dismemberment in the future. That’s because car makers typically comply with such fuel-efficiency rules by reducing the weight and size of the vehicles they produce. Generally speaking, the lighter and smaller a vehicle is, the less safe it is in a collision. Under Pruitt, the Trump administration exited the awful Paris Agreement dealing with the mitigation of greenhouse gas emissions, and slashed economy-killing regulations such as those related to the Clean Power Plan, which was President Obama’s declaration of war on power plants and coal country. Pruitt restored the rule of law by rescinding the insane Waters of the United States (WOTUS) rule, a truly grotesque Obama-era power grab that literally gave EPA the power to regulate land containing puddles unconnected to larger bodies of water. Generations of Americans will be healthier and wealthier because Pruitt acted boldly at EPA. Some who would have perished in car crashes will get to live. Posterity’s verdict on the fallen Environmental Protection Agency chief will be that he was thrown under the bus by people who should have known better. Congressional Republicans, and elements of Conservatism Inc. allowed his ouster to happen. The knives were out for Pruitt from the moment he was nominated. Leftists saw the damage he could do to their bureaucratic fiefdom at EPA and enlisted help from their allies in the media, as well as from squish Republican office-holders. Pruitt could have easily weathered these storms if he enjoyed institutional support. Evidently he felt he didn’t have it so he quit. Feeding conservatives to the crocodiles only guarantees that crocodiles will enjoy a steady diet of conservatives in the future. Let Scott Pruitt, a great conservative who went down fighting, be Exhibit “A” for this proposition. This article by Matthew Vadum first appeared July 6, 2018, at FrontPageMag.